There are countless ways to enjoy pinole in your daily diet. You can even blend it together with other power foods and your favorite toppings! Here’s one recipe that we know you’ll love and whose nutritional benefits practically leap off the page! Special thanks to our friends at Thrive Market for this delicious recipe!! Warm coconut oil in a small saucepan over medium heat and stir in blueberries. Sauté until they begin to release their juices, then stir in almond milk. Add pinole and cook for 3 to 5 minutes, stirring frequently, or until mixture begins to thicken. 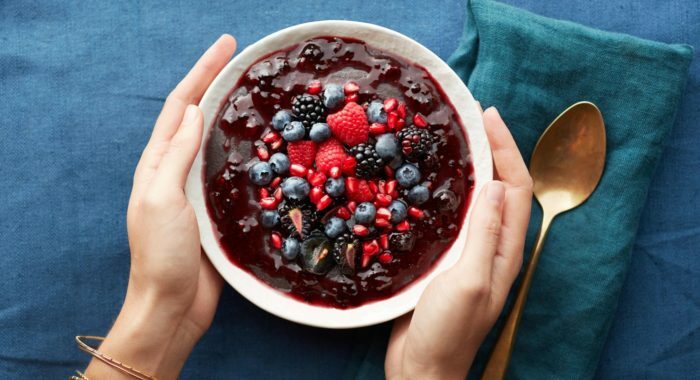 Transfer to a bowl and top with a dollop of blueberry jam and fresh fruit to serve. Can I microwave pinole rather than use the stove top….every minute counts in the morning! Thanks for your questions Trish! You can! Try filling a coffee mug halfway with milk or milk substitute and then adding in two heaping spoonfuls of your favorite flavor of Purely Pinole. Dissolve the pinole completely so it looks like chocolate milk. Microwave for 1 min. Remove and stir to de-clump. Then zap it for another 25 seconds and you’ll have a delicious pinole breakfast on the go! This also works great for the office!